Yes, it is true, straight out of Pineapple Express. I’m excited cause it means I can have this decent brown without the skunk flavor that pervades the bottled version. 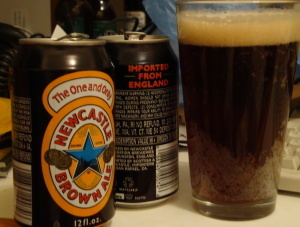 From Scottish & Newcastle, Newcastle pours a ruddy brown, quite clear, with a bit of creamy tan head. The nose is fairly malty, with notes of caramel and toast. There is a prominent cooked corn sweetness to the aroma, indicating dimethyl sulfide(DMS). Some consider this an integral part of the character of certain beers, but I’d call it a flaw. The flavor is strongly corny, with a bit of malt in the background and prominent sweetness. There is just a hint of dark malt character coming off as a bit of roastiness. The palate is smooth and creamy, almost satiny.